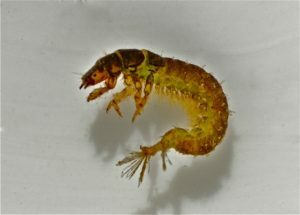 Spotted Caddis Larva, Hydropsyche species, collected from Apple Creek, photo by Paul Swarmer. IN JUNE AND LATER IN NOVEMBER of 2012, the Clear Fork River Chapter of Trout Unlimited (CFRTU) conducted a benthic macroinvertebrate survey (BMS) of Apple Creek. Insofar as we know, the only other BMS of Apple Creek was conducted by the Ohio Division of Wildlife 20 years ago when the Division was evaluating the stream for its potential to be included in Ohio’s put-grow-and-take brown trout stocking program. For more on this, see the article on “Apple Creek Trout Fishery in Grosjean Park.” Trout Unlimited has decided to resume these surveys; the reasons for doing so are explained here. WHAT IS A BENTHIC MACROINVERTEBRATE? Benthic macroinvertebrates are animals that are big enough (macro) to be seen with the naked eye. They lack backbones (invertebrate) and live at least part of their lives on the bottom (benthos) of a body of water. In our studies, the animals we surveyed live in the bottom of streams among sand, gravel and stones, as well as fallen logs, branches, leaves and other decaying vegetable matter, and aquatic plants. Examples of benthic macroinvertebrates are insects (such as mayflies, caddisflies and stoneflies), snails, clams, worms and crayfish. They may be just a sixteenth of an inch long, such as midge larvae, or clams and crayfish that can be several inches long. WHY SURVEY FOR MACROINVERTEBRATES? The single most important reason is to test for water quality. Some species of aquatic organisms, e.g. mayflies and stoneflies, are highly sensitive to chemical pollutants and only occur in high quality streams. Other species, e.g. blood midges and rat-tailed maggots, are pollution tolerant and indicators of chemically compromised streams often with low oxygen content. In between these extremes, are invertebrates that tolerate slightly to moderately polluted streams. WHY ARE MACROINVERTEBRATES IMPORTANT? Benthic macroinvertebrates are a critical part of the aquatic food web in Apple Creek. They form a vital link to the food chain connecting the nutrients in aquatic plants, algae, and decaying leaf litter to the fish species in the stream. The condition of the benthic macroinvertebrate community reflects the stability and diversity of the larger aquatic food web. Another reason to survey for macroinvertebrates, at least for those of us that are fly anglers, is that we can get a much better idea of the selection of flies we should be carrying with us in our fly boxes when we fish Apple Creek. WHY NOT JUST TEST FOR CHEMICAL POLLUTANTS? Chemical tests of water samples can be very expensive. Moreover, such tests can be misleading, providing information only on the presence of chemicals at the time of sampling. Pollutants may have come and gone by the time a sample is taken. The sudden disappearance of a pollution intolerant invertebrate, however, can indicate an earlier polluting event. Also, compared to chemical testing, macroinvertebrates are easy to collect and can be identified by trained volunteers. In the survey conducted in June, CFRTU also collected data on water clarity, temperature, oxygen content, pH, presence of nitrates and phosphates as well as bacteria such as E. coli. Future BMS surveys by CFRTU will include tests for physical and chemical parameters such as these. The second method uses a sturdy, long-handled net with a D-shaped opening. The dip net is used to sample the undercuts of banks, leaf packs, sediment and aquatic vegetation. The leading flat end of the net is dipped into the sampling area, and the contents emptied into a tray. HOW ARE THE SURVEY SAMPLES RATED? The macroinvertebrate samples are subjected to a qualitative rating system, called a Pollution Tolerance Index (PTI). The presence or absence of a particular aquatic group, e.g. a caddisfly, is recorded. In this rating system, number of caddisflies is not considered. Those aquatic invertebrates that are very “intolerant” of poor quality water are given a weighting factor of 4 and this factor is multiplied by the number invertebrates listed in that group. A maximum of 7 invertebrate groups are listed under “very pollution intolerant” by the PTI index. At the other end of the spectrum are the “very pollution tolerant” invertebrates that are given a weighting factor of 1. Other invertebrate groups are given a weighting factor of 2 or 3. A maximum PTI rating for a collection site on a stream is 58. A rating of 10 or less indicates poor water quality, 11-16 fair water quality, 17-22 good water quality, and 23 or more excellent water quality. HOW DID APPLE CREEK RATE ON THE PTI SYSTEM? “Remarkably well” is the answer! In June the two stretches of stream sampled rated 37 and 30, well above a score of 23 for an excellent rating. In November these two stretches rated an astounding 42 and 47. Apple Creek by this measure is a very, very healthy, stream. Of the most sensitive, pollution tolerant macroinvertebrates, Apple Creek was a home to stoneflies, mayflies, caddisflies, riffle beetles, water penny beetles and gilled snails. The only member of this pollution intolerant group not sampled was the dobsonfly. WHAT ABOUT THE FUTURE? TU will continue to monitor Apple Creek by sampling benthic macroinvertebrates on a regular schedule. Decisions must be made on the number of times per year to sample the stream and to increase the number of sites sampled. The first indication of point or site specific pollution of Apple Creek likely may come from these surveys. This may also prove true for non-point pollution such as from farming communities in Apple Creek’s headwaters. In any event, this gives community leaders an opportunity to identify and mitigate pollution of what is proving to be a remarkably healthy stream and the home to one of Ohio’s newest and successful trout fisheries. The CFRTU gives special thanks to Don Boysel and Don Dean of the Mad Men chapter of Trout Unlimited who have given their time and expertise in helping us to conduct these surveys and showing us how to sample and identify benthic macroinvertebrates. It would not have happened without them! Information presented here came, in part, from the handbook “My Healthy Stream” by Williams, Dombeck and Wood and from the 4th edition of the “Volunteer Stream Monitoring Training Manual” published by the Miami (Ohio) Conservancy District” and written by Sarah Hippensteel.